Sail between Scotland to Iceland via the Faroes for awe inspiring ocean sailing and coastal exploration. Whether you sail this route north to Iceland or south to Scotland, you are in for a real treat. This expedition is all about northern wilderness. 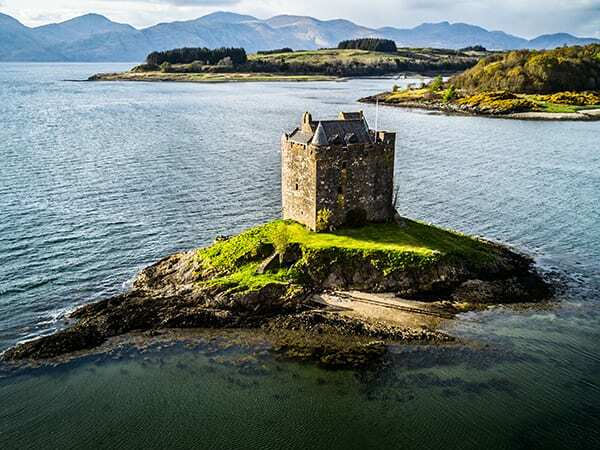 Scotland, offers amazing anchorages, famous whisky distilleries and wonderful views. The Faroes presents staggering wildlife, and is a wonderful place to explore. After the faroes is an exhilarating voyage to stunning Iceland. If you are a sailing novice don’t let this put you off because full tuition is provided. In Scotland you’ll have time to explore some of the beautiful west coast with its world famous whisky distilleries. You’ll experience the soaring volcanic cliffs of the Faroes with their swirling fogs and wide variety of birds. after a truly exhilarating sail get amongst the ice capped fjords of eastern Iceland. This is a typical itinerary for the north bound route from Scotland to Iceland. For the southbound route please reverse what you see here, noting it finishes in Stornoway on the Hebrides. What makes expedition sailing so special is that there can be no fixed itinerary and so the detailed itinerary below can be indicative only. The wind and the weather ultimately shape actual timings and what's possible each day. Join the boat between 1200 and 2000hrs in Oban or Seydisfjordur (the closer to 1200 the better but we know flights and such like don't always work like that, so don't worry!) Get your belongings packed away and relax. There's plenty of things to do in the future but right now it's about relaxing, finding your way around the boat and enjoying the surroundings. Today is all about getting up to speed with the boat. Whether you are a complete novice or more experienced sailor, everyone benefits from detailed introductions, safety briefings and training sessions. You will have two highly experienced instructors guide you through every aspect that you need to know to have a great ocean sailing holiday. By lunchtime we should be casting off the lines, hoisting the sails and working through all the key sailing manoeuvres such as tacking and gybing, reefing and knot tying! By the end of the day everyone on board should feel comfortable with the basics - even though there's more to learn and practice every day. We'll find a beautiful anchorage for the night or maybe even make it to a lovely harbour such as Tobermory on Mull. Now we will sail the 200nm or so north to Stornoway in the Hebrides. There are amazing anchorages, famous whisky distilleries and wonderful views. There are too many possibilities to list but Skye and Harris are great places to sail to and explore. All the time we will be keeping an eye on the weather, planning our charge north to the Faroes. Ultimately we expect to pull in to Stornoway for a day of rest and preparation before setting off into the Norwegian sea! When the wind is right, we will set off for the c. 350nm to the volcanic archipelago of the Faroes. This is a great introductory offshore passage, taking about two days. You will start to get a feel for the open ocean, living and sailing in a watch system and learning how to run a ship offshore. It is really special as the near vertical cliffs and thousands of sea-birds appear over the horizon and we will probably make landfall in the capital - Torshavn. The northern Faroes are particularly beautiful and if the weather is good to us we will have time to sail and explore a little here. It is a wild, green, untamed land with grass on roofs, whales, puffins and a unique way of life. All the time we will be watching the weather and doing final preparations for the big voyage north. Days 12-15: Open ocean sailing to the east coast of Iceland. It's time though to say goodbye to the Faroes and set off north for the truly exhilarating sail to Iceland. The Faroes will soon disappear over the horizon and we will be all alone except for the puffins, auks, common guillemots and kittiwakes as they see us on our way. We may well see a whale or two as day turns into night and we helm under the stars and via the moon. Ocean life is a wonderful and timeless rotation of watches, navigation and routines. It's the perfect time to learn from our hugely experienced instructors, who are on hand at every stage of the way. Soon the towering mountains of eastern Iceland will appear over the horizon. It is another wonderful and exciting sight and it's not unusual to make landfall in swirling mist, with ice capped mountains and maybe a whale for company! As the sky clears you will see a stunningly beautiful land and if have made good time, we should have time to visit some of the fjords such a Nordfjord and Radafjord before making our final stop in Seydisfjordur. The end comes all too soon, but there’s no doubt that you’ll go home with some unforgettable memories and having had a huge amount of fun. After cleaning up, swapping photos and saying goodbye to the boat and the crew, you’ll be free to disembark from 1200h. RYA sailing qualifications where applicable. The yacht itself is an expedition yacht that was previously a round the world race boat. The accommodation on the yacht is comfortable, warm and spacious. Each bunk is 6′ 7″ long and has its own USB charger and light. Sleeping is in one 8 berth cabin. There are two toilets, a shower, hot water and lots of food! We eat very well on board and we will take as much fresh fruit and veg as we can. Ocean sailing is an exercise in using food creatively but you can expert lovely warm meals, as much as you can eat, freshly baked bread and more. We can cater for most diets and have loads of veggies on board. If you have any severe allergies you must check with us before booking. You should join the boat in Oban, Scotland after 1200 hrs on the joining day, or Seydisfjordur if on the southern route. It is good if you can join us as close to 1200 hrs as possible, but if your flight or ferry gets in later than this, that is fine. We will ask you closer to the time to let us know your travel details. Stornoway airport is served by direct flights from the mainland (all less than about an hour’s duration) from Aberdeen, Edinburgh, Glasgow and Inverness. Flights are by Flybe and Eastern Airways. Caledonian MacBrayne ferries sail at least twice daily in each direction between Ullapool and Stornoway (one each-way crossing on Sundays). Scottish Citylink coaches operate service number 961 (booking essential) from Ullapool to Inverness (& v-a-v), with luggage handling through to Stornoway arrivals hall. Citylink connects with coach services from Glasgow and Edinburgh, which in turn connect with the National Express network. From Reykjavik (the internal airport) you need to transfer by bus or taxi to Keflavik (IATA code: KEF) which is the international airport. These adventure sailing holidays are open to everyone aged 18 years and over. If you are aged 70 or over, or have any concerns about your health, we ask that you get a doctor’s note before booking. This is just to make as certain as possible that you will be okay out on the water. or join in Iceland and sail to Scotland Aug 18 – Sep 01 2019. No all training is provided. We love this sailing company’s ethos – to help people do three things: sail, train and explore. They are passionate about enabling people to experience life out on the open ocean, building sailing skills and exploring some beautiful countries. After years of training people to become professional sailors, and having covered thousands of miles between them, the company Founders realised that so many people had dreamt of setting off across an ocean, but hadn’t the skills, the boat or crew to make those dreams come true. The company now runs expeditions on a specialised 60’ yacht to some of the most exciting places out there – often largely inaccessible from land. With no previous sailing experience required, the two instructors will guide you every step of the way as you develop your sailing skills, maybe even earning an RYA qualification during the week. Exploring on land as they go is just as important and the bikes and a kayak mean you can head off and enjoy everything there is to see along the route. Awe inspiring ocean sailing and coastal exploration, between Scotland, the Faroe Islands and Iceland.